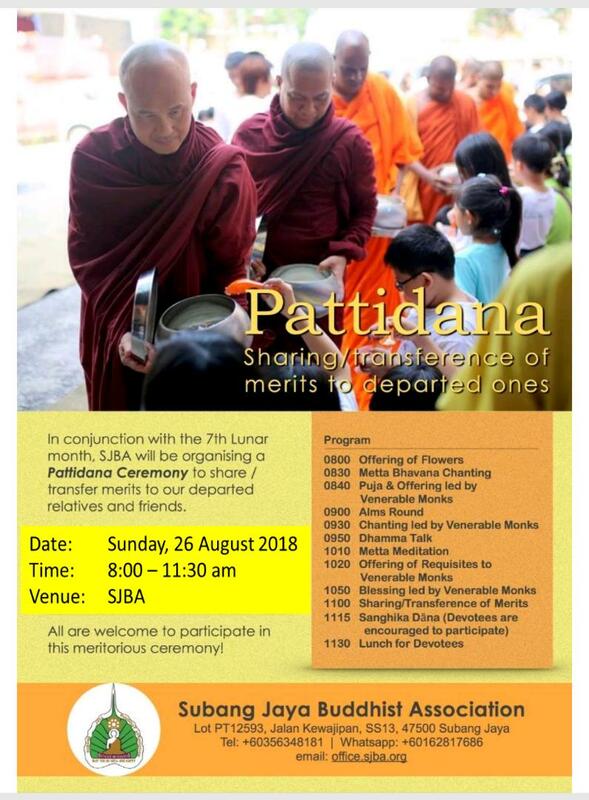 1) In conjunction with the 7th Lunar Month, SJBA is organising a Pattidana (Dedication of Merits) Ceremony this Sunday, 26 August 2018 for the departed ones. When those departed relatives and friends, who may been reborn in certain unfortunate state of existence, become aware that their departed relatives performing meritorious deeds dedicated to them, they can feel relief. If they rejoice repeatedly, their unhappy birth can be transformed into a happy one. It is the duty of relatives to perform acts of merits for the departed ones. The program will start at 8.00am with the offering of flowers, candles and pure water, followed by Pindacara, chanting, Dhamma Talk, offering of requisites, dedication of merits to the departed ones and followed by Blessings by the Sangha and lunch dana. 2) SJBA is celebrating our country’s 61th Merdeka Day on 31st August 2018 (Friday). The Celebration will start with a Merdeka Breakfast at 7.45am, followed by Flag Raising Ceremony, Blessings by the Venerable Monks, cutting of Merdeka cake and fellowship. Members and devotees are invited to join us for the Celebration. To encourage our members’ children to strive for excellence in their academic performance, SJBA will present Academic Excellence Awards to students who excelled in their examinations in 2016. The Awards will be given out on Merdeka Day, 31st August 2018. 3) There will be a special Dhamma Talk by Luang Pu Boonsong Thittasara in SJBA Shrine Hall on 30 September 2018 (Sunday), 8.30pm, followed by Breakfast Dana on 1 October and 2 October, 6.30am in SJBA. Luang Pu Boonsong Thittasara, 81 years old with 51 vassa, is the Abbot of Wat Santivanaram. He was once under the tutelage of Luang Pu Whaen (disciple of of Luang Pu Mun) and other famous meditation teachers. Luang Pu Boonsong Thittasara now teaches monks and lay devotees in the forest tradition. 1) In conjunction with the 7th Lunar Month, SJBA is organising a Pattidana (Dedication of Merits) Ceremony on 26 August 2018 for the departed ones. When those departed relatives and friends, who may been reborn in certain unfortunate state of existence, become aware that their departed relatives performing meritorious deeds dedicated to them, they can feel relief. If they rejoice repeatedly, their unhappy birth can be transformed into a happy one. It is the duty of relatives to perform acts of merits for the departed ones. The program will start at 8.00am with the offering of flowers, candles and pure water, followed by Pindacara, chanting, Dhamma Talk, offering of requisites, dedication of merits to the departed ones and followed by Blessings by the Sangha and lunch dana. 6) SJBA invite you and family and friends to a spiritual and mentally enriching morning at this Sunday’s Buddha Puja, commencing at 9.15am. This Sunday Puja will be conducted by the Tarabuddy, a Fellowship Group of Indonesian students studying in Monash University and Sunway University. They are celebrating Tarabuddy’s 10th Anniversary. From 9am to 2pm, you can also explore Indonesian’s culture, food, etc at their Indonesian Day Bazaar. Merdeka1) In conjunction with the 7th Lunar Month, SJBA is organising a Pattidana (Dedication of Merits) Ceremony on 26 August 2018 for the departed ones. When those departed relatives and friends, who may been reborn in certain unfortunate state of existence, become aware that their departed relatives performing meritorious deeds dedicated to them, they can feel relief. If they rejoice repeatedly, their unhappy birth can be transformed into a happy one. It is the duty of relatives to perform acts of merits for the departed ones. The program will start at 8.00am with the offering of flowers, candles and pure water, followed by Pindacara, chanting, Dhamma Talk, offering of requisites, dedication of merits to the departed ones and followed by Blessings by the Sangha and lunch dana. 6) SJBA invite you and family and friends to a spiritual and mentally enriching morning at this Sunday’s Buddha Puja led by Ven. Indarathana, commencing at 9.15am with offering of lights, flowers and incense to the Buddha, chanting, Dhamma Talk, Blessings by the Sangha and Sharing of Merits. The Puja Session will be followed by a joyful session of Learning The Dhamma through Hymn singing to invigorate our mind and spirit to challenges of a new week. In conjunction with the 7th Lunar Month, SJBA is organising a Pattidana (Dedication of Merits) Ceremony for the departed ones. When those departed relatives and friends, who may been reborn in certain unfortunate state of existence, become aware that their departed relatives performing meritorious deeds dedicated to them, they can feel relief. If they rejoice repeatedly, their unhappy birth can be transformed into a happy one. It is the duty of relatives to perform acts of merits for the departed ones. The program will start at 8.00am with the offering of flowers, candles and pure water, followed by Pindacara, chanting, Dhamma Talk, offering of requisites, dedication of merits to the departed ones and followed by Blessings by the Sangha and lunch dana at 11am. All are welcome. 1) During the Vassa Period, Ven. Indarathana will lead in chanting the Dhammacakkappavattana every day, 7.30pm to 8.15pm. On Tuesdays, the chanting will followed by Pali Chanting & Sutta Study. 2) All devotees are welcome to our Monday Metta Meditation session at SJBA Meditation Hall from 8.30pm to 9.45pm. This cultivation of metta focus on loving kindness to oneself, loved ones and all other beings. On every 1st Monday, our Resident Monk will be guiding the meditators especially the newcomers. 3) There will be Day Retreat in SJBA during New Moon and Full Moon Days from 9am to 5pm. The Retreat is free and easy and participants can feel free to join in or leave any time. Vegetarian lunch will be provided. 4) SJBA is organising “What Buddhist Believe” – a course on the fundamental concepts of Buddhism over 9 consecutive Thursdays, beginning 3rd August 2017. This course will be based on the book of the same title, written by our late chief Ven K. Sri Dhammananda Nayaka Thero. As such, participants are encouraged to read this book prior to attending, to get a better understanding. To participate, please register with Sister Lily at SJBA Office. 5) In conjunction with the 7th Lunar Month, SJBA is organising a Pattidana (Dedication of Merits) Ceremony for the departed ones. When those departed relatives and friends, who may been reborn in certain unfortunate state of existence, become aware that their departed relatives performing meritorious deeds dedicated to them, they can feel relief. If they rejoice repeatedly, their unhappy birth can be transformed into a happy one. It is the duty of relatives to perform acts of merits for the departed ones. The program will start at 8.00am with the offering of flowers, candles and pure water, followed by Pindacara, chanting, Dhamma Talk, offering of requisites, dedication of merits to the departed ones and followed by Blessings by the Sangha and lunch dana. All are welcome. 6) SJBA invite you for a spiritual and mentally enriching morning at this Sunday’s Buddha Puja. The Puja will start at 9.15am with Offerings to the Buddha, Chanting, Dhamma Talk by Venerable Indarathana, Hymns and Guided Meditation. 5) SJBA is celebrating our country’s 60th Merdeka Day on 31st August 2017 (Thursday). The Celebration will start with a Merdeka Breakfast at 7.45am, followed by Flag Raising Ceremony, Blessings by the Venerable Monks, cutting of Merdeka cake and fellowship. Members and devotees are invited to join us for the Celebration. To encourage our members’ children to strive for excellence in their academic performance, SJBA will present Academic Excellence Awards to students who excelled in their examinations in 2016. The Awards will be given out on Merdeka Day, 31st August 2017. For more information, please call Sis. Lily at tel. 03-56315299. 6) In conjunction with the 7th Lunar Month, SJBA is organising a Pattidana (Dedication of Merits) Ceremony for the departed ones. When those departed relatives and friends, who may been reborn in certain unfortunate state of existence, become aware that their departed relatives performing meritorious deeds dedicated to them, they can feel relief. If they rejoice repeatedly, their unhappy birth can be transformed into a happy one. It is the duty of relatives to perform acts of merits for the departed ones. The program will start at 8.00am with the offering of flowers, candles and pure water, followed by Pindacara, chanting, Dhamma Talk, offering of requisites, dedication of merits to the departed ones and followed by Blessings by the Sangha and lunch dana. All are welcome. 7) SJBA invite you for a spiritual and mentally enriching morning at this Sunday’s Buddha Puja. The Puja will start at 9.15am with Offerings to the Buddha, Chanting, Dhamma Talk by Venerable Indarathana, Hymns and Guided Meditation. 1) In conjunction with Qing Ming, SJBA is organising a Pattidana on this Sunday, 9 April 2017, 8am to 11am, to dedicate merits to the departed ones. Pattidana is for the benefit of those departed relatives and friends who may have been reborn in certain unfortunate state of existence. When they are aware that their relatives or friends have performed some meritorious deeds dedicated to them, they can be relieved of their suffering. When they rejoice repeatedly, their unhappy birth will be transformed to a happy one. It is the duty of relatives to perform these acts of merits for the departed ones. The Pattidana will start with the offering of flowers and lights at 8am, Metta Recitation, Buddha Puja, Dhamma Talk by Bhante Nyanaramsi, Dedication of Merits to Departed Ones. 2) The construction, renovation and upgrading works of SJBA Vihara is almost complete except for the sewage treatment plant. The ground floor toilets will also be refurbished soon. Final touch-up, rectification and clearing works are still in progress. Devotees are reminded to be mindful of own safety when inside the Vihara’s compound. Our Sunday Dhamma School will reopen this Sunday, 9th April 2017 for existing students. New Students will also be registered on the same day. Registration is open now, on first come first serve basis. Confirmation of place is upon submission of Registration Form with Payment to Sis. Lily (Tel. : 03-56315299, 016-3379086). 1) In conjunction with the 3-month Rains Retreat (Vassa), the Sunday Dhamma Talks in SJBA will be delivered by either Venerable Indarathana (1st and 3rd Sundays) or Sayadaw U Pannasara (2nd and 4th Sundays). Sayadaw U Pannasara will also lead Mondays’ Metta Meditation and Thursdays’ Vipassana Meditation. Starting from 6 August 2016, SJBA’s Bhojjanga Chanting Session has been rescheduled to the 1st Saturday of the month, from 8.30pm to 10pm. Venerable Indarathana will lead in the recitation of the Parittas for protection from various forms of misfortunes, sicknesses, evil spirits, influence of planetary system as well as instilling confidence in the mind. Members and devotees are invited to come with relatives and friends to heal oneself and others. Starting from 10 Aug 2016, from 8.30pm to 9.30pm, Venerable Indarathana will start a new Wednesday Spiritual Group Cultivation with the objective to learn and practice the Dhamma. The session will include puja, chanting, short guided meditation and Dhamma discussion. All are welcome to join in this spiritual cultivation to cultivate the mind and develop compassion and wisdom. (2) In conjunction with the 7th Lunar Month, SJBA is organising a Pattidana (Dedication of Merits) Ceremony on 14 August 2017 for the departed ones. When those departed relatives and friends, who may been reborn in certain unfortunate state of existence, become aware that their departed relatives performing meritorious deeds dedicated to them, they can feel relief. If they rejoice repeatedly, their unhappy birth can be transformed into a happy one. It is the duty of relatives to perform acts of merits for the departed ones. The program will start at 8.00am with the offering of flowers, candles and pure water, followed by Pindacara, chanting, Dhamma Talk, offering of requisites, dedication of merits to the departed ones and followed by Blessings by the Sangha and lunch dana. All are welcome. (3) Members and devotees of SJBA are cordially invited to celebrate our country’s 59th Merdeka Day at SJBA on 31st August 2016 (Wednesday). The Celebration will start with a Merdeka Breakfast at 7.45am, followed by Flag Raising Ceremony, Blessings by the Venerable Monks, cutting of Merdeka cake and fellowship. To encourage our members’ children to strive for excellence in their academic performance, SJBA will present Academic Excellence Awards to students who excelled in their examinations in 2015. The Awards will be given out on Merdeka Day, 31st August 2016. The closing date for application for the Award is 31 July 2016. On the same day, SJBA is also organizing a Blessings Service for students sitting for UPSR, PT3, SPM, STPM, etc. examinations this year, conducted by the Members of the Sangha. (4) SJBA’s “Buy a Brick” Campaign will stop on 31 August 2016. The Campaign has been very successful to raise funds for the construction of our extension block. Each brick is RM100 and donors can write their names on the bricks or sign on the bricks which will then be used for the construction of the new block. It is estimated the brick-works of our new block will be completed by mid September. All bricks sponsored from now to 31 August 2016 will be used to construct 3 new Monk Rooms at the Roof Top. (5) This Sunday Dhamma Talk (31/7/16, 10am) will be given by U Pannasara who is staying in SJBA Vihara for the Vassa. Sayadaw U Pannasara was in Myanmar in 1972. He was ordained at the age of 20 in Khun Taung Gyi. After passing his Buddhist Scriptures and Buddhist Scripture education (Dhammacariya) in 2003, he practised Vipassana Meditation at the Mahasi Meditation Centre under the guidance of Ven. Nayaka Sayadaw Jatila. He graduated from the Mahasi Training School for foreign Buddhist Mission. Sayadaw U Pannasara has been teaching the Dhamma and Vipassana Meditation in Thailand and at the Lunas Hermitage, Kedah. (6) This Sunday’s Dhamma Talk in Mandarin (31/7/16, 11.30 am at Sima Hall) is on “Practical Application of Dhamma” by by Sis Tan Yee Yong. Sis Tan Yee Yong graduated with Bachelor of Science in Computer Sience and MBA. She obtained MA in Buddhist Studies from IBC, Thailand. She is now a Dhamma committee member of SJBA. (1) Members and devotees are invited to participate in the 5th Day Vassa Chanting on 23 July 2016, Saturday, 7.30pm, to commemorate the day the Buddha taught the Anattalakkhana Sutta to His first 5 disciples of the Buddha who had by listening to this sermon, meditating on the five aggregates of clinging and realizing 3 higher stages of supramundane knowledge that lead them to the attainment of Arahantship. (4) This Sunday Dhamma Talk (24/7/16, 10am) will be given by U Pannasara who is staying in SJBA Vihara for the Vassa. Sayadaw U Pannasara was in Myanmar in 1972. He was ordained at the age of 20 in Khun Taung Gyi. After passing his Buddhist Scriptures and Buddhist Scripture education (Dhammacariya) in 2003, he practised Vipassana Meditation at the Mahasi Meditation Centre under the guidance of Ven. Nayaka Sayadaw Jatila. He graduated from the Mahasi Training School for foreign Buddhist Mission. (5) This Sunday’s Dhamma Talk in Mandarin (24/7/16, 11.30 am at Sima Hall) is on “Practical Application of Dhamma” by by Sis Tan Yee Yong. Sis Tan Yee Yong graduated with Bachelor of Science in Computer Sience and MBA. She obtained MA in Buddhist Studies from IBC, Thailand. She is now a Dhamma committee member of SJBA.